How to implement financial ratio analysis the right way! What is the purpose of financial ratio analysis? ​Are you looking for a complete list of financial ratios? - If your answer is YES, you've come to the right place! This article will look into five major categories of financial ratios that you can use to evaluate your company's financial health. Financial ratios are mathematical tools, used to assess and analyze a business’s financial standing and performance. They can be very useful when evaluating and comparing the fundamentals of various companies, especially when you’re looking at them in terms of potential investment opportunities. In the list of financial ratios above, as you can see that there are five major categories of financial ratios. These ratios are commonly used by investors, and we’ll take a closer look at each of them, in turn, below. Don’t let yourself be intimidated by the fact that financial ratio analysis involves combing through a company’s financial statements to determine and understand its financial position, trends and effectiveness over a period of time. The ratios involved in performing this fundamental analysis are actually quite easy to grasp and compute, and when used properly, will give you a useful and meaningful way to compare the financial situations of businesses both large and small, across a range of industries. ​The first category of ratios included in our list of financial ratios is the liquidity ratio. Liquidity describes the state of a company’s assets, in terms of how quickly and easily it can turn those assets into cash when necessary. When you use a liquidity ratio to analyze a business’s financial statements, you’re basically determining its ability to cover its short-term debts, and this can give you some idea of how successful it will be in continuing its current operations. More specifically, the liquidity ratio measures a company’s liquid assets against its liabilities, and there are several versions of this measurement, including the quick ratio, the current ratio, and the operating cash flow ratio, that you can use. Each version is valuable in its own way, but whether you’re measuring a company’s income alone against its liabilities, or a combination of its cash-on-hand plus its receivables, the higher the ratio value involved, the more confidence you can have in a company’s current ability to service its short-term debt load. So what is the financial ratio used to assess a company's liquidity? ​The second category of ratios included in our list of financial ratios is the solvency ratio, which is also the most important financial ratio. Unlike liquidity that deals with an ability to handle short-term debt, solvency deals with a company’s ability to service its long-term liabilities. In other words, does the company have the resources to support its continuing financial obligations, and are those resources based on equity or debt? For example, a business with a highly variable, or unpredictable income, runs a far greater risk of insolvency when it chooses to fund large portions of its operations with borrowed money, rather than with its own assets. Two of the most common solvency ratios you can use are the debt-to-equity ratio, and the times interest earned ratio. Also known as leverage ratios, solvency ratios directly measure a company’s total debt against its assets, equity, and earnings. While both solvency and liquidity ratios are essential in measuring a company’s ability to pay off debt, solvency ratios are more concerned with long-term sustainability. And unlike liquidity, a higher solvency ratio value is less desirable, since it may indicate that a business has incurred a higher debt load than it can handle. So what is the financial ratio used to assess a company's solvency? ​The next financial ratio category included in our list of financial ratios is the efficiency ratio. You can use an efficiency ratio to measure how well a business is using its assets and liabilities to generate sales and income. This type of ratio lets you translate a company’s efficiency in areas like debt repayment, receivables collection, and equity usage, into actual numbers that can compare the performance of one business with another in the same industry. In a sense, efficiency ratios help to give you a picture of the company’s profitability, since the more efficiently it manages its resources, the more likely it is to become, and remain, profitable. These ratios can also tell you something about the effectiveness of an organization’s management team. Efficiency ratios may measure either the value of a company’s assets against its sales, or its Account Payables against its total supplier purchases. In the case of the former, a higher ratio value means the company is using a relatively low level of assets to generate income; while in the latter, a lower value tells you that short-term liabilities are being handled efficiently. So what is the financial ratio used to assess a company's efficiency? One of the most important ratios in our list of financial ratios is the profitability ratio. As its name implies, a profitability ratio simply measures an organization’s ability to generate profits from its regular business operations. Most profitability ratios determine a company’s return on investment from their inventory and other assets, and so are related in some ways to that company’s business efficiency. More specifically, the profitability ratio can help you to measure business income against various groupings of business expenses, in order to better evaluate the level of a company’s earnings. This is best done in comparison with a direct competitor, or over a period of time, in which case a higher or rising ratio value will tell you the company’s profitability level is better than others, or is improving. Profitability is also a reflection on a company’s ability to manage debt, and to remain solvent, and because they incorporate a range of performance aspects like these into their equations, profitability ratios are the most widely used of all the financial ratios. So what is the financial ratio used to assess a company's profitability? ​The final category of financial ratios included in our list is the business valuation ratio. Business valuation is simply another name for determining the financial or ‘fair’ value of a given company. As an investor, this is the process you go through, or should go through, every time you consider whether or not an investment is worthwhile. But because this can be a daunting and somewhat overwhelming task, given the amount of financial information available about the average business, some simple business valuation ratios can help to simplify things. One of the most well-known valuation ratios is called the Price to Earnings (P/E) Ratio. This formula conveniently compares a company’s current share price with its Earnings per Share (EPS), in order to determine how much investors are currently paying for each dollar of that company’s earnings. Business valuation ratios are particularly useful for comparing companies within the same market sector, or within the entire market as a whole, because they define how cheap or expensive an investment is in terms of its potential for profit. So what is the financial ratio used to assess a company's value? ​There you have it - the complete list of financial ratios! Because financial ratios are proportional, and don’t rely on the size of a given organization, they can be used to compare the financial information of businesses across a wide range of industries. At the same time, you should realize that an impressive ratio in one market sector may be viewed altogether differently in another. Overall, to be as meaningful as possible, financial ratio analysis should always begin with reliably accurate information, and should involve consistent financial comparisons from period to period, and from benchmark to benchmark. 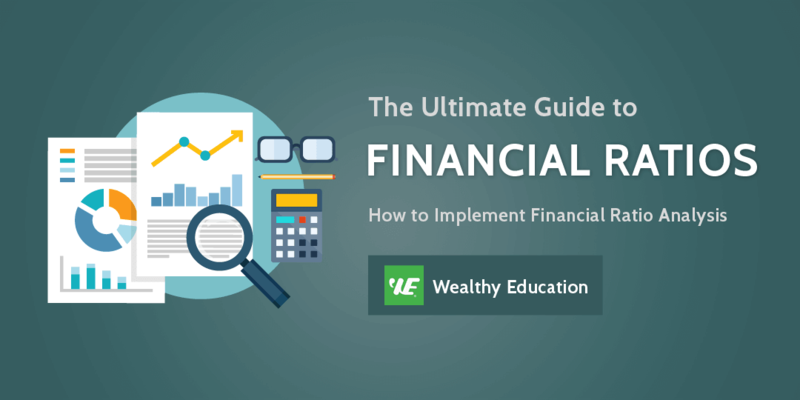 Hope you enjoy the above detailed list of financial ratios​, and make sure that you don't forget to download our FREE "The Ultimate Financial Ratio Cheat Sheet".